Five of the Top 10 greatest post-season sluggers in MLB history are members of The 500 Home Run Club®. 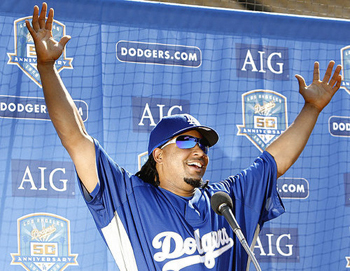 The reigning prince of the post-season longball, Manny Ramirez, padded his play-off stats by slamming one into the cheap seats during this year’s NLCS versus the Phillies. “Man Ram” now has 29 post-season dingers (seven ahead of the next nearest power-hitter on the all-time list below) and a .285 batting average in his 410 post-season at bats. In addition to holding the all time post-season HR mark, Ramirez is tied with Pete Rose for the longest hitting streak (15) in the history of League Championship Series play. 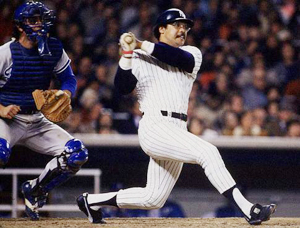 "Mr. October" Reggie Jackson always seemed to save his best play for the post-season. On October 18, 1977, Jackson hit three homers on three consecutive swings off three different Los Angeles pitchers in the sixth and deciding game of the Fall Classic. Only one other player - fellow 500HRC member Babe Ruth - has ever hit three balls into the stands during a single World Series game. In the 1978 Series, Jackson picked up where he left off in 1977, homering in the first game to give him six round-trippers in four consecutive WS games (another record) and in the sixth game to give him seven in back-to-back Series (still another record). Although Manny has the most post-season homers by far, he does not own the best percentage for MLB post-season home runs per at bat. That honor goes to “The Bambino” Babe Ruth who hit the ball out of the playing field approximately one out of every 11 times he stepped up to the plate in post-season play. 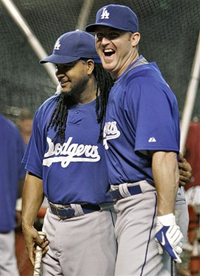 The only other player who hit home runs at a more prolific rate during post-season play is Ramirez’s teammate on the 1993-2000 Phillies and the 2009 Dodgers – Jim Thome.